With a song in my heart and a smile on my face, Civilian Theatre came as close he ever will to skipping with joy out of theatre at the end of Forbidden Broadway. 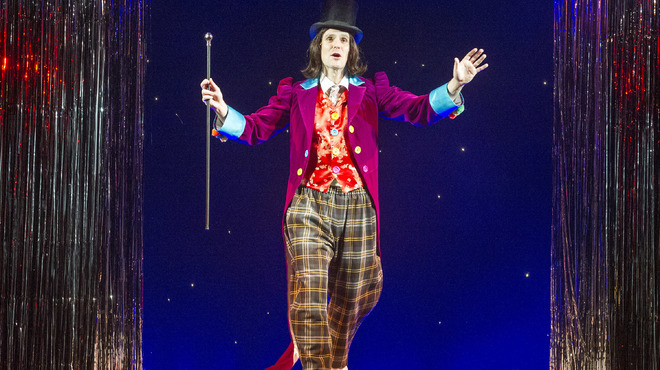 This relentlessly silly, endlessly enjoyable show has transferred from the Menier Chocolate Factory to the Vaudeville to a fill a gap in scheduling after the short notice postponement of Rabbit Hole. It is a mark of the show’s fluid nature that a joke about being a ‘late season replacement’ has already been shoehorned in. 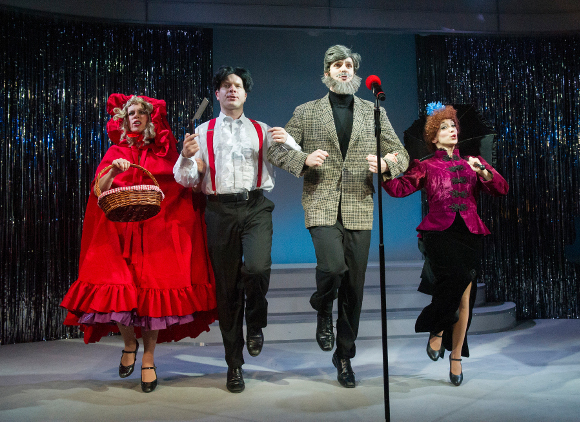 Forbidden Broadway has been around New York since the early 1980s but the nature of the show allows it to seamlessly weave in new musicals as they appear and as a result it broadly resembles the current West End, with The Book of Mormon and Once coming in for two of the most vicious sketches. Joining the London cast is Christina Bianco, a star in the Broadway run and perhaps as importantly from the ticket agencies point of view, someone whose Youtube video of Let It Go has racked up more than 5 million hits. A not insignificant number when you have a mainly unknown cast and a West End theatre to fill. The variety on display is quite startling. There is no plot, not even an attempt at one. This is a musical revue through and through, and the talented performers seem to be enjoying themselves as much as the audience. It reminded, more than anything else, of the Reduced Shakespeare Company – a fixture in London for many years. The cast, Christina Bianco, Anne-Jane Casey, Damien Humbley and Ben Lewis, are impressively versatile and can switch between musical genres at the drop of a hat. They work well together as an ensemble and there isn’t a weak link among them, but it was Bianco demonstrating a stunning range in her pitch-perfect takedown of Kristin Chenoweth that came closest to bring the house down. Like all parody shows there are hits and misses. However the ratio is certainly in favour of the hits, and even the misses are well sung. It is a show that does require a pretty good knowledge of musical theatre, and it has been written by people who know the form inside out – something seen in their canny choice of beginning with their take on ‘Fugue For Tinhorns’ from Guys and Dolls; a song that any musical aficionado will know has a fair claim of being the best opening number of any musical. The first sense you have of a real viciousness for musicals deemed not up to scratch (pretty much anything from Cats up to the present day) is during the merciless satire of Miss Saigon, which takes a not dissimilar approach to the show that the Americans took to the Viet Cong. By the end there is not much left standing. The second half does lose momentum as its New York origins does lead to an over-reliance on parodying people that you would struggle to recognise unless you were a true fan. That being said the Elaine Page reference is one of the funniest things I have seen on stage all year. Does the show have anything serious to say? Surprisingly, underneath all of the snarky humour, it probably does. 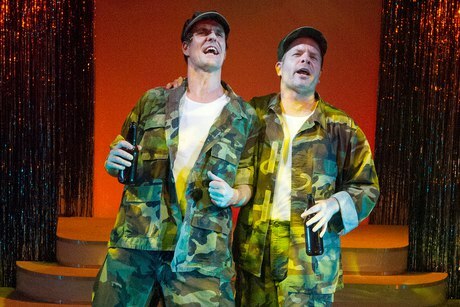 It is telling that Into the Words is a subtle and loving tribute to Sondheim. It is done with grace and a careful ear for getting the style exactly right. It is also telling that as the shows get more modern, the satire gets ever more vicious. The show comes to close with a love-letter from Blithe Spirit costumed Angela Lansbury to the Broadway that has disappeared before ending with a showstopper that associates a number of well-known corporate brands with the song, captured so chillingly in Cabaret, of the Hitler Youth, Tomorrow Belongs to Me, from Cabaret. Finally, and fittingly, it proves there is a bitter undercurrent to what could have been a cloyingly sweet production.